Over 200 Samaria residents bear signs and block road in response to wave of rock throwings, shootings and attempted bombings. 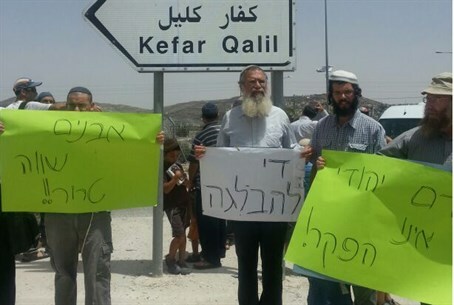 Roughly 200 residents of Samaria demonstrated on Tuesday afternoon at Har Bracha Junction, located just south of Shechem (Nablus), in protest of the recent spate of Arab terrorist attacks plaguing the region. The protesters, who bore signs with messages such as "rocks equal terror," and "Jewish blood is not to be abandoned," sealed the highway for roughly half an hour according to Walla!. There has indeed been a sharp rise in attacks: on Tuesday morning dozens of Arab terrorists threw rocks at Israeli cars and burned tires on the road by the Arab town of Hawara, near Tapuah Junction in Samaria. Two Israeli citizens were lightly injured and two vehicles were damaged. An Arab terrorist on Monday night shot at IDF soldiers at the same Tapuah junction, injuring one lightly before we was shot to death. The terrorist was revealed to be a Fatah member. Last Friday, security forces apprehended an Arab terrorist wearing a bomb belt at the exact same location, and were able to prevent the attack in time. Participants in the protest on Tuesday included rabbis from the Samaria region, as well as Shomron (Samaria) Regional Council head Gershon Messika. "It can't be that week after week the lives of Jews here are abandoned. I call on the Israeli government: let the IDF win and eradicate terror on the spot," declared Mesika during the demonstration. In response to the growing amount of terror attacks involving stones and molotov cocktails on roads in the area, local residents have called on the government to build a highway skirting Hawara to enable secure access to Jewish communities and prevent the daily clashes.